Squeeze in a workout in just about any space. This compact treadmill is thinner, lighter, and smaller than the typical ones, so it’s easy to pull out and stow away. Use it on hard surfaces only—no rugs or carpet. It also goes button-free by using infrared stepping technology to track your body’s position and make the treadmill start, stop, and adjust speed. Hit up to five miles per hour (with the bar up) when you’re walking, jogging, or using it as a walking desk. Dimensions: 55" x 25" x 3.8"
Treadly Maker Ronen Chen was feeling cooped up. A move from California to New York—in winter—had him missing the ease of just stepping outside to get some exercise, and his apartment wasn’t large enough for a treadmill. Cue Ronen’s light bulb moment to make a scaled-down treadmill that can fit in pretty much any space. Treadly is thinner, smaller, and lighter than a traditional treadmill. 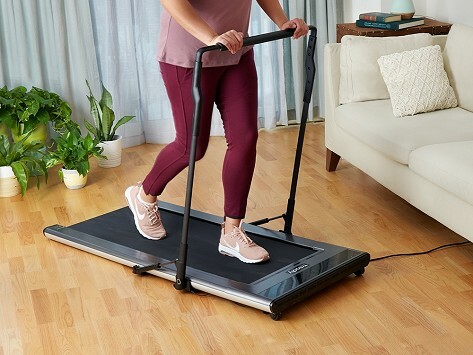 It weighs in at 64 pounds and is just over two feet wide and three and a half inches thick, which makes it easy to pull out for workouts and slide away (like under the sofa) when you’re done. Use it on hard surfaces only—no rugs or carpet. Along with delivering on convenience and accessibility, Treadly streamlines operation by going button-free. Infrared stepping technology tracks your foot position on the belt to start and stop and adjust speed up to five miles per hour, perfect for a light jog.